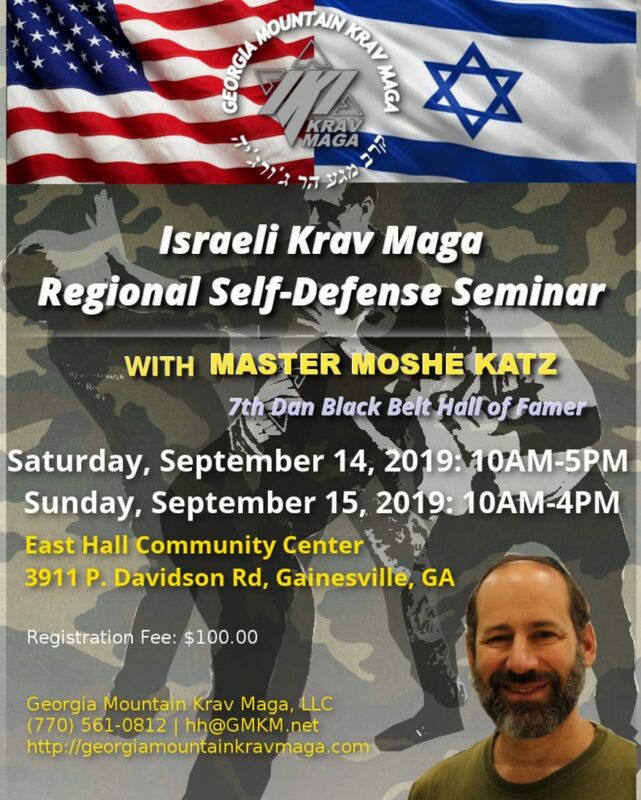 September 14th and 15th we are having our FALL TWO DAY REGIONAL GMKM – IKI KRAV MAGA SEMINAR headed by Moshe Katz, founder and chief instructor of Israeli Krav International. Open to all styles as well as to those with no martial arts experience. This system is pure simplified real world street defense. Please click on “about” at top of this page for more information about the IKI system and GMKM. LOCATION: GMKM Training Center: East Hall Community Center – Gainesville, GA. See home page of website for address and map link. Just Click on “SHOP” tab at the top right of this page. We will have a lunch break about mid way on each day. Wear whatever you might wear on the street. Please try to plan to be there. You will be glad you attended. Please contact Hal Herndon via the “CONTACT” tab at top of this page, email hh@gmkm.net or call (770) 561-0812 if you are interested. All classes are open to all students, all ranks. FREE INTRODUCTORY CLASS!!! We offer anyone who has not tried out our IKI/Krav Maga system a chance to try out what we have to offer by attending one class for free! Please call 770.561.0812 or email to arrange an appointment. We try to schedule introductory classes for Wednesday evenings or Saturday mornings.